In recent history, no other natural phenomenon was at the center of such intense political debates as climate change and global warming. Interestingly, in this ongoing and vehement debate, often bipartisan consensus seems to be more important than scientific evidences. Scientific, balanced and convincing explanations of these concepts are simply crucial now than ever before as they are being increasingly labeled as hoax or scam, and experts who talk about them are often referred to as members of the “climate change cult”. 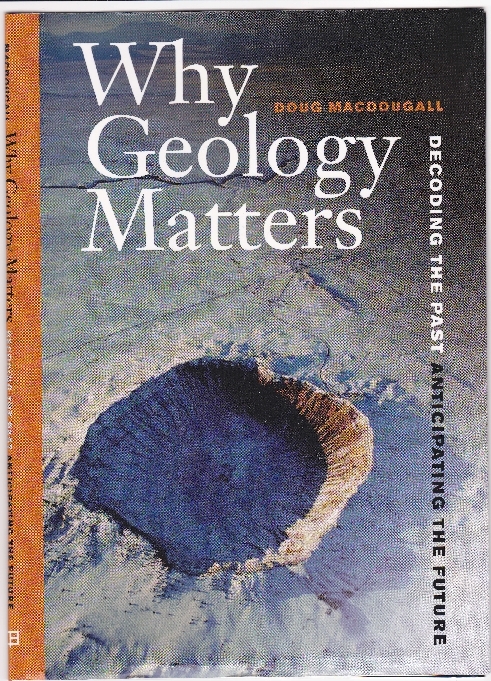 In this context, Doug MacDougall’s work Why Geology Matters: Decoding the Past, Anticipating the Future is immensely relevant. The book explores man’s likely role in climate change through scientific expositions of past climate changes and ways of addressing them. After giving an overview of the Earth’s history in terms of information gathered through rocks and ice cores in a language that even laymen can understand, MacDougall argues, in a remarkably convincing way, that climate change is a reality. However, he also admits that the causes of such changes still remain a mystery and our understanding of the phenomenon is very limited. In the chapter entitled “The Great Warming” he points out that though production of carbon dioxide through human activity in the Earth’s atmosphere happens so rapidly, as we run out of fossil fuel, and alternative fuel become more in use, its cessation will be fast too. He also points out that man-made carbon dioxide may be absorbed by the ocean, resulting in rapid decline in temperature once the peak emissions has passed. Though much has been learned about the probable consequences of human-induced changes, he says, paleoclimatologists are still looking for clues to decode them so that they can forecast the Earth’s climate more accurately and reliably. The most invaluable aspect of the book is that here the author provides sober and compelling scientific explanations of natural phenomena that were often used by doomsday predictors. The book sufficiently emphasizes the human role in global warming and presents a case for immediate human intervention. Doug MacDougall is Professor Emeritus of Earth Sciences at Scripps Institution of Oceanography at University of California, San Diego and currently resides in Edinburg, Scotland. Basic Research: Why Should it be a Higher Priority of the Government?